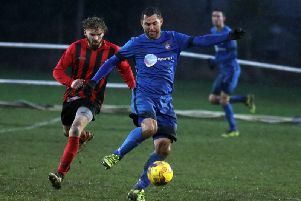 Rothwell Corinthians picked up a crucial win in their quest for survival in the Future Lions United Counties League Premier Division as they beat Eynesbury Rovers 2-1 at Sergeants Lawn. Jim Scott’s team did their damage in the first half as they opened up a 2-0 lead before the visitors pulled one back, despite being reduced to 10 men. But it continues to be a season of struggle for Whitworth and they remain at the foot of the table after a 6-0 home defeat to Boston Town. Desborough Town picked up a second successive 3-0 victory as they won at struggling Kirby Muxloe. All the goals came in the second half with Adam Dalby opening the scoring on 51 minutes and the advantage was doubled when Jason Turner converted a penalty after he had been fouled. And it was Turner who rounded it off with his second of the game. It was a tough day for Wellingborough Town, however, as they suffered a heavy 7-1 defeat at third-placed Rugby Town. 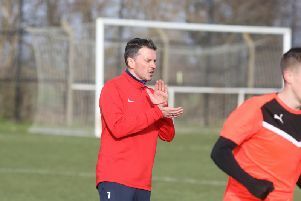 Carlos Lewis was on target for the Doughboys to make it 2-1 at one stage but Troy Johnston was sent-off and the hosts then ran in five goals in the latter stages. The local derby in Division One went with form as Irchester United scored four second-half goals to seal a 4-0 success over bottom side Raunds Town. The deadlock was broken by Nathan Heycock on 55 minutes and the Romans took control with Ryan Lovell and an Alfie Taylor brace securing the points. Rushden & Higham United suffered a 3-2 loss at Blackstones. Lewis O’Dell gave the Lankies the lead but the hosts hit back to lead 3-1 before Jake Reynolds’ late goal proved to be only a consolation.